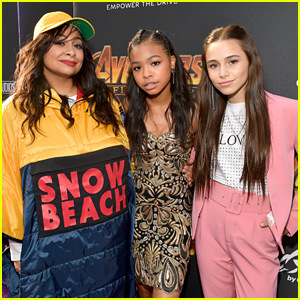 Navia Robinson and Sky Katz pose with Raven-Symone on the purple carpet at the premiere of Avengers: Infinity War on Monday night (April 23) in Los Angeles. The three Raven’s Home stars took a break from filming season two of their Disney Channel show for the event, along with co-stars Jason Maybaum and Issac Ryan Brown. black-ish‘s Miles Brown was also see at the premiere event with his Captain America backpack, as well as The Fosters‘ Hayden Byerly and Izabela Vidovic. FYI: Navia wore an Ema Savahl dress, Katy Perry Collection shoes with jewelry from Vita Fede, Kukka Jewelry and Les Nereides. Kayla Maisonet keeps it cute, comfy and chic at The Lion King Sing-Along event held at The Greek Theatre in Los Angeles over the weekend. The Stuck in the Middle actress joined her rumored boyfriend Nathaniel Potvin and on-screen brother Issak Presley for the event, celebrating the new Bluray and DVD release of the hit movie, hosted by Walt Disney Studios and Fandango. Madison Hu, Nikki Hahn, Monique Coleman, Brandon Severs, Jillian Shea Spaeder, and Raven’s Home stars Jason Maybaum and Issac Ryan Brown were also at the event. Who else is just loving Raven’s Home? So are we! 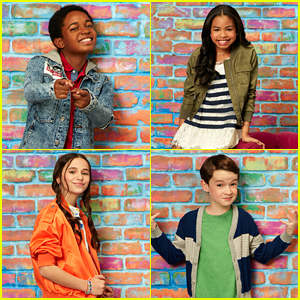 With an all-new episode just days away, we know you’re wanting to know more about the four kids on the show and JJJ has the exclusive scoop! Jason Maybaum stars as Levi Grayson, Chelsea’s only child. He’s described as “responsible and levelheaded”, in fact he’s so responsible and levelheaded that we feel like he’s the parent instead of Chelsea! We played a little rapid fire with Jason during an interview with him and found out that he wouldn’t ever give up french fries for anything. Us too, Jason. Us too. We’re in the middle of summer and in JJJ‘s minds, we’re all at the beach in a place where the sun never goes down with amazing music and amazing friends. The only thing missing? SUMMER TREATS! JJJ reached out to the Raven’s Home cast to help us make the perfect summer treats and they did not disappoint one bit! Issac Ryan Brown, Navia Robinson, Sky Katz and Jason Maybaum all picked out super yummy, delectable and classic treats that after work today, we will be seeking out. Navia Robinson is all smiles at the premiere of Descendants 2 held at Arclight Theater in Hollywood on Tuesday night (July 11). The Raven’s Home star met up with her co-stars Issac Ryan Brown, Jason Maybaum, Sky Katz and Anneliese van der Pol. Bunk’D stars Miranda May, Karan Brar, Nina Lu and Nathan Arenas were also at the event, with Trinitee Stokes. If you missed it, check out the opening titles to Raven’s Home, which premieres right after Descendants 2 on July 21st! Disney Channel Releases New 'Raven's Home' Pics & First Episode Summary! Check out the first pics from Disney’s all new show, Raven’s Home! 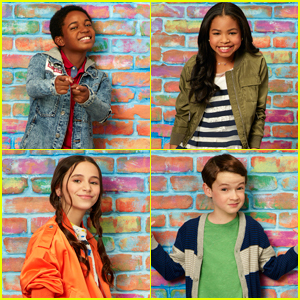 The new pics show off the new cast members — Issac Ryan Brown, Navia Robinson, Jason Maybaum, and Sky Katz — who will make their Disney Channel debut in July. 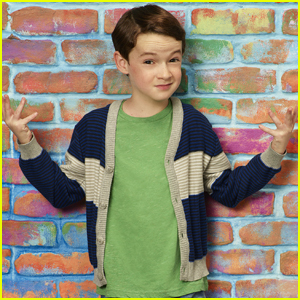 In the first episode, called “Baxter’s Back”, Booker enlists Levi and Tess to help him convince Nia of his newfound abilities to see into the future, because she isn’t believing anything. Meanwhile, Raven’s latest vision involves a family disagreement that leads her to meddle in her kids’ life at school. If you missed it, check out the latest Raven’s Home trailer on JJJ now!